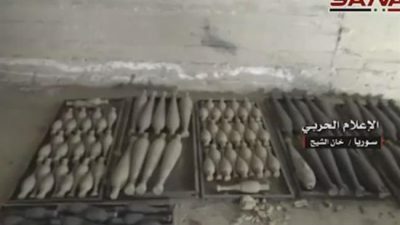 Syrian military forces have discovered a large cache of Israeli-made weapons in the strategic city of Mayadin in Dayr al-Zawr province, days after retaking the eastern city from Daesh terrorists. The weapons included several types of heavy, medium and light firearms that beside Israel, came from some European countries as well as members of the NATO military alliance, Syria’s state news agency SANA reported Thursday, citing a field commander. The commander said they had also found mortars, artillery equipment, large quantities of anti-armor munitions and a NATO- made 155mm cannon with a range of up to 40km (about 25 miles). This was not the first time that the Syrian government forces made such discoveries from terrorist hideouts across the country. According to SANA, only a few days back they captured an Israeli cannon along with large amounts of weapons, ammunition and communication equipment from Takfiri terrorists in the area of ​​Jib al-Jarrah in the eastern Homs countryside. Although Israel has sought to avoid direct involvement in the six-year conflict, it has acknowledged conducting frequent attacks against military targets in Syria, in what is considered by experts as an attempt to prop up terrorist groups among their many losses. The latest of such attacks occurred on Thursday, when Israeli tanks fired shells into Syrian territories from the occupied Golan Heights. The office of Israeli Prime Minister Benjamin Netanyahu confirmed the attack, calling it a response to a “projectile” that was allegedly fired from Syria earlier in the day and landed on “open ground” without causing any casualties. The attack followed an Israeli aerial violation of Syria’s airspace near the Lebanese border on Monday. Syrian military forces responded to the intrusion by opening fire on the aircraft, hitting one and forcing them all to flee. According to a statement by the Syrian army, the Israeli jets then fired multiple missiles from inside the occupied Palestinian territories, causing material damage to a Syrian army position in the countryside of the capital Damascus.